I found this awesome site and thought you might like it too. 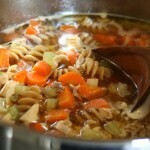 The link is athttp://www.sodura.com/so-easy-homemade-chicken-noodle-soup/. I have found a great recipe for making a whole chicken in the crock pot that is tasty and so tender.Â But the best part is, is that you can easily make chicken noodle soup with what is left over.Â After getting all the good meat off the bones, just leave it in the crock pot, add a couple of key ingredients and leave it in the crock pot all night long.Â When you wake up, you will have the richest broth for making yummy, healthy, chicken soup!Â For some reason, I am so proud of making my own home-made chicken stock for soup, that I had to share the recipe.Â First I have the link to the recipe for the whole chicken, then the broth and then the chicken.Â I hope you enjoy it as much as we do!Â And the kids love it too.Â I even let them eat it at their Aero Table, because our finishes are tough enough to handle the mess that will be brought on.